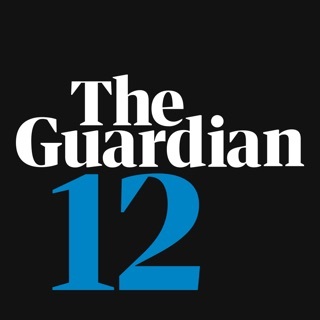 Discover award-winning journalism and live world news with The Guardian. 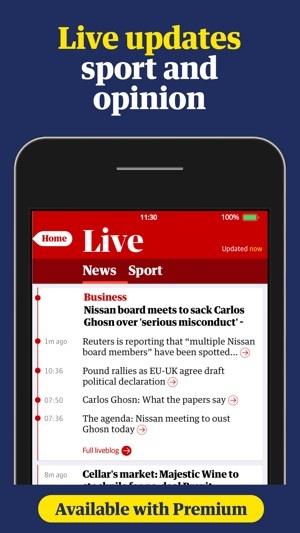 Get breaking stories, sport and opinion on the go. Stay up to date with live news and sport, wherever you are. 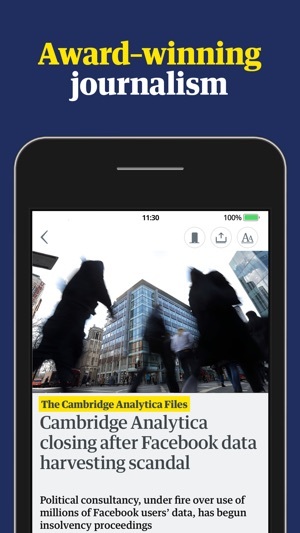 Explore stories, UK headlines and content on a whole range of topics; from business to music, finance, politics, recipes & much more. Follow your favourite stories, writers or football teams for personal notifications. You can also fully customise your newsfeed, read comments on articles and share your own thoughts. Enjoy audio, video and interactive content, as well as full-screen photo galleries. 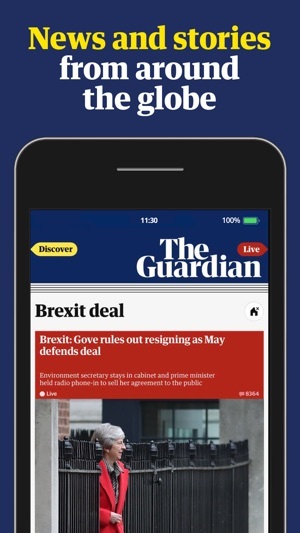 Access The Guardian's full range of journalism straight from your phone. Thinking of upgrading your news? 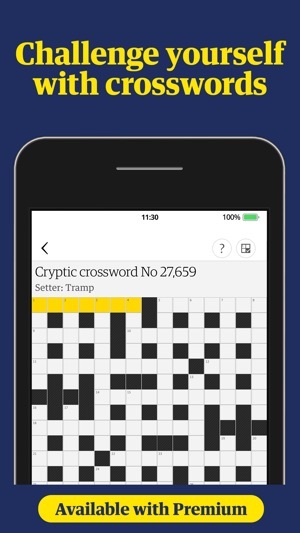 Upgrade to the Premium App to support independent journalism. Plus, access our enhanced features for a better way to experience the news that matters. This app is totally free to use. If you choose to upgrade to the premium tier, your payment will be processed by Apple. 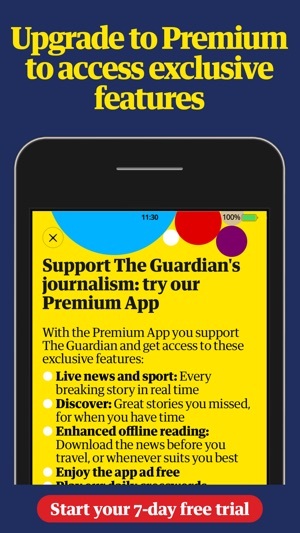 Upgrade by selecting ‘Support the Guardian’ from the app’s navigation menu. Premium subscriptions automatically renew on a monthly basis unless auto-renew is turned off at least 24-hours before the end of the current period. Your iTunes account will be charged for renewal within 24-hours prior to the end of the current period. You may turn off auto-renewal after purchase by going to your iTunes Account Settings. Please note - while Apple's Family Sharing feature can be used to share apps between up to six family members, it does not support the sharing of in-app purchases (as described in https://support.apple.com/en-gb/HT203046). This includes the auto-renewable subscription to the Premium App, and you will therefore not be able to share any subscription purchased via iTunes Store with family members. 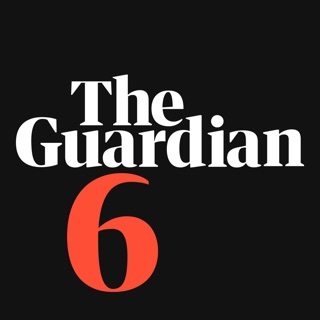 If you have any questions please email subscriptions@theguardian.com who will be able to advise you further. 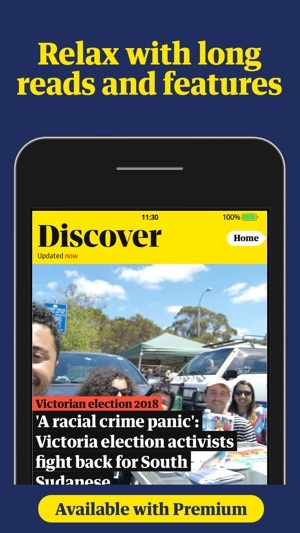 Beautifully designed and easy to navigate, this app from the award-winning newspaper delivers the intelligent stories and thought-provoking analysis that the periodical has been known for since it launched way back in 1821. 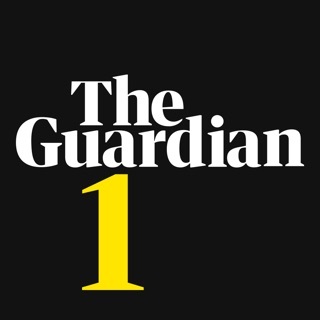 From insight into the evolving pop-culture scene to the latest breaking news, The Guardian provides incisive coverage in a thoroughly modern format through captivating photo essays, thoughtful op-eds, essential sports reports and even interactive crossword puzzles. The guardian broke some massive stories in recent years such Snowdon papers. It does have a good range of articles in its comments pages. However it does feel at time like its trying a bit hard to be London yoga crowd pleasers in its lifestyle stuff. However the thing that bugs me the most is the very poor moderators. In comments pages a very poorly and inconsistent policed. Certain comments issues such as Israel/ Palestine as just bizarrely censured. Careful and balance criticism are deleted but factually inaccurate and angry almost aggressive criticism left up. I would like to say it was just or once or twice I’ve seen it but happens time and again. It’s not even stuff that could be libellous. You cant say it has a bias pro or against it is just totally inconsistent even minute to minute on the same article. You have one comment unfairly deleted the find you can’t comment on the article again even if it’s a completely different point. It has also happened to a couple of my friends on different topics. None were making unpleasant/ nasty or factual dodgy comments. They either should just close the comments or at least have some quality control on their dreadful moderators.